WEST LAFAYETTE, Ind. - College students who visit their campus gyms are more likely to succeed in the classroom, according to data from Purdue University. "Students who worked out at Purdue's gym at least once a week were more likely to earn a higher grade point average than students who visited less or not at all," says Tricia Zelaya (pronounced Zah-LIE-ah), assistant director for student development and assessment at Purdue's Division of Recreational Sports. "Going to the gym is so much more than going to the gym. Students who are motivated by fitness and wellness tend to have better time management skills, and research shows that being fit is good for the mind. It all ties together." For example, the more than 1,820 students who visit Purdue's France A. Córdova Recreational Sports Center at least 16 times a month earned a GPA of 3.10 or higher. The correlation between grades and gym use also is shown with moderate users. 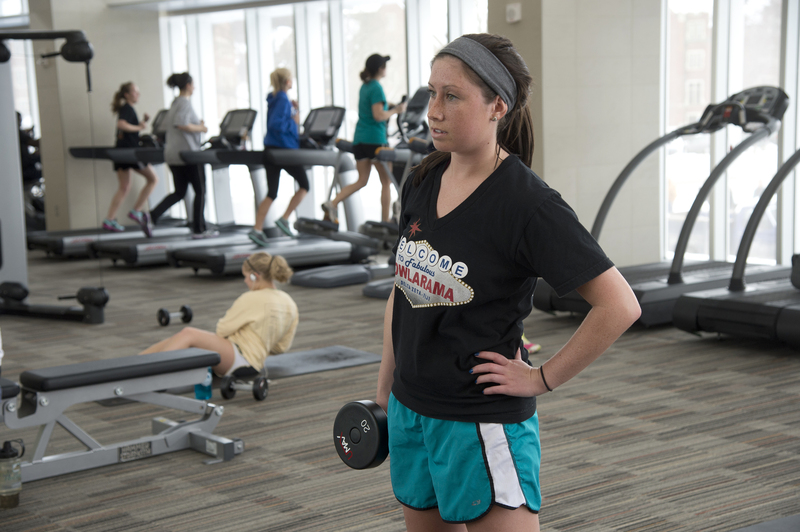 Students who used the gym at least seven times a month had an average GPA of 3.06. This data is based on spring semester 2010 gym use and grades, which was tracked by students checking in using their student identification number. Using these identification numbers, school officials can then generate a report based on GPA. Because the facility was under renovation the last two years, comparable data for recent semesters is not available, but will be later this year once a full semester is recorded. So far, the preliminary data is showing the same trend, Zelaya says. Renovations to Purdue's facility are part of a national trend. The National Intramural-Recreational Sports Association reports that more than $1.7 billion dollars has been spent or is allocated for new construction, renovations or expansions for U.S. college recreational facilities in 2010-2015. "Universities are making this investment to improve student life and retain students, but we think something more is happening," Zelaya says. "Some might assume time at a gym is a distraction from academics, but it is really part of the learning landscape." Bonnie Tjeerdsma Blankenship, Purdue professor of health and kinesiology, says there is research that shows how physical activity has a positive impact on student academic achievement, including children preschool through 12th grade. "It's not a surprise to see this relationship for college students," says Blankenship, who monitors a Midwest study that looks at how an exercise-based afterschool program contributes to elementary school students' cognitive function. "The cognitive benefits of physical activity is something I emphasize in our physical education teacher courses, and it's a lifestyle habit that is never too young to learn." Facilities such as Purdue's are being renovated to increase space and to add services that support health and wellness. At Purdue, registered dietitians are on staff to discuss nutrition, and students have access to personal trainers and fitness consultants. Representatives from the Student Wellness Office are also onsite. "Student success research shows that engaged students do better academically, and we see that when they come here with their friends as well as classmates or study groups," Zelaya says. "This is a place where students learn to use physical activity to cope with stress. Being fit also is about getting the appropriate amount of sleep, and that is key to doing well in school. Our goals for success go beyond the classroom and are aimed at helping young people develop healthy habits for life." While many universities have studied user demographics, such as frequency of on- or off-campus students who visit the gym, Zelaya says comparing grades with gym use is a new trend, which is made easy by new student identification card swipe systems in these updated buildings. Purdue's center was part of a student-driven $98 million renovation to expand the facility, which now has about 355,000 square feet and nearly 7,000 student users daily. The renovation tripled the number of strength and cardio machines and added a 1,200 square-foot cycling center. 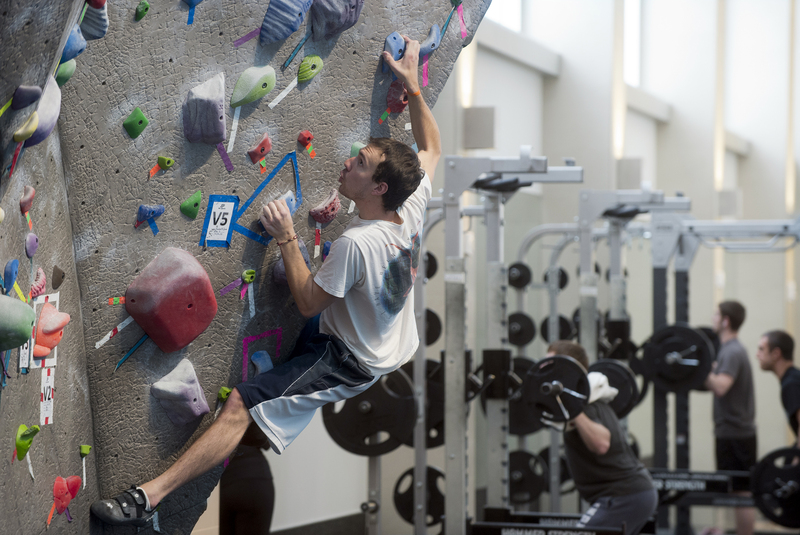 The facility also features a recreational pool, climbing and bouldering walls, designated racquetball and wallyball courts, an indoor hockey and soccer court, and running tracks. Purdue was home to the first university facility in 1957 dedicated solely to students for their recreational sports needs. Note to Journalists: Journalists interested in speaking to the source or visiting the Purdue center to interview students can contact Amy Patterson Neubert, Purdue News Service, at 765-494-9723, apatterson@purdue.edu. B-roll footage and related broadcast-quality interviews are available to journalists by contacting Jim Schenke, Purdue News Service, at 765-237-7296, jschenke@purdue.edu.